Grant McCann celebrates a win when caretaker-manager at Posh last season. Photo: Joe Dent/theposh.com. Peterborough United manager Grant McCann believes he has one of the best squads in League One. One of his major tasks now is to make the players believe it as well. Posh manager surveys the scene ain a friendly at Boreham Wood. Photo: Joe Dent/theposh.com. McCann is a modest, as well as model, professional. There will be none of the tub-thumping bombast of previous summers when predictions of promotion were more common than the sun. McCann expects his club to go well. He expects his players will play with freedom and with the confidence to express themselves. But he will go no further than that. There are some big clubs in League One and Posh will have to play consistently excellent football to finish above them. “We will be playing some top teams,” McCann said. “The likes of Sheffield United and Charlton will have some excellent players, but I have some excellent players as well. Lee Angol's injury was a big pre-season blow for Posh and manager Grant McCann. photo: Joe Dent/theposh.com. 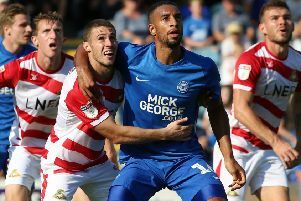 “I don’t go in for predictions about where we will finish, but I am determined that Peterborough United will play exciting, attacking football. “We will be positive in the way we set up for games and I will be positive with my changes during games. “It’s the only way I know how to play football. It’s the way I played the game and it’s the way I will be as a manager. “My job initially is to get the players believing in themselves so they can play with confidence and freedom. “We have a talented squad and I want them to show it every time they step on the field. “Pre-season went well for us with the obvious exception of serious injuries to Lee Angol and Brad Inman. “I don’t take a lot of notice of the results in friendlies, but it is good that we won a few games and that we beat strong opposition like Leeds and Brentford. “The win at Brentford was pleasing because it showed we can win by playing well defensively. “It’s not the way I want to play, but sometimes you have no choice. “I never liked pre-season as a player. It’s obviously been a bit different as a manager and I was very happy with the way we structured the summer to give us the best chance of starting the League One season well. “But I’m glad it’s out of the way now and we can concentrate on the competitive matches. “I’m as excited now as I was when I was playing. “It’s obviously a new challenge for me as a manager, but I’m up for it. “I’ve learnt a lot from working as an assistant manager in the last two seasons, but now the decisions and the responsibility are mine.